Brands looking for innovative ways to promote their products in an increasingly saturated media space should investigate influencer marketing. 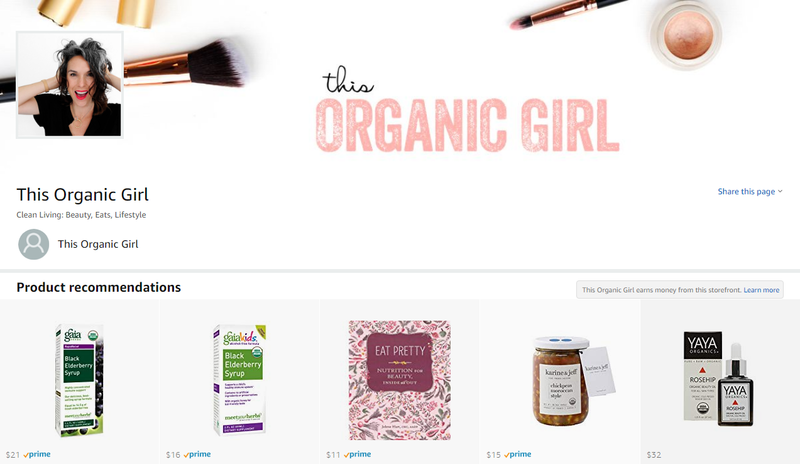 Both on and off Amazon, influencers can help brands build trust with consumers in their niche. This is a new frontier for many brands and even Amazon hasn’t worked out all of the kinks with their own influencer marketing platform. Now that Amazon has launched Influencer Storefronts and Social Media Coupons, some brands are looking closely at influencer marketing as a strategy to drive more brand and product awareness. 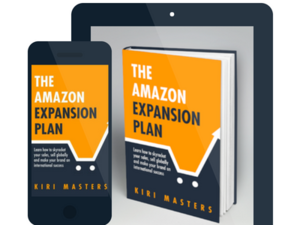 Here’s what brands need to know how to get the most out of this emerging tactic on Amazon. Influencer marketing is the practice of partnering with a person who has a large and engaged audience to promote and sell products in a specific niche. For example, a brand might partner with a beauty blogger who specifically mentions their products on her podcasts, blogs, and social media accounts. In the past, only celebrities had the reach to influence buying patterns. Now anyone with a large social media following might be worth investigating as a potential partner. Influencer marketing is highly effective when done well. According to Tomoson, an influencer marketplace, businesses see a return on investment of about $6.50 for every dollar spent on influencer marketing. Who should use influencer marketing? There are some categories for which influencer marketing is particularly powerful. Beauty. Perhaps the most popular category for influencers because consumers are accustomed to watching tutorial videos that showcase specific products and icons in the space tend to naturally recommend their favorite products. Because the industry is so broad, influencers help brands niche down and reach their ideal audience. Diet, health, exercise and weight loss. With so many conflicting messages around health and diet, these categories benefit from the added credibility that influencers provide. Influencers help buyers discern the difference between a useful product that delivers results and a fad that wastes their time and money. Toys. Parents look to see if the toy is fun, educational and interesting before investing in it for their children. Some of the most popular videos watched by children on Youtube are “unboxing” videos and other content which show what the products look like coming out of the box and being played with in real life. Electronics. Even before influencer marketing was a marketing buzzword, buyers of electronics looked to testimonials by real people to decide what electronics to purchase. Influencer marketing for electronics is a natural extension of that habit. Unboxing videos are popular in this category as well. Brands that are actively selling on Amazon can see a bump in search traffic for effective influencer campaigns. When the shopper knows what they want, they are also more likely to convert once they find the product. This helps with all key aspects of the Amazon SEO “flywheel”: relevant search traffic, more sales, and better conversion. It could also lower PPC costs due to an improved conversion rate. Last year, Amazon quietly introduced the Amazon Influencer Program, enabling influencers to sell directly to their fans. With a storefront, influencers can create a seamless experience for their audience. If, for example, an influencer does a weekly YouTube video and they’re talking about specific makeup products, they can simply direct viewers to their Amazon marketplace. When viewers click the link, they find a customized page which is organized and optimized by the date of the video they just viewed. It’s seamless for the buyer and makes purchasing easy. For brands looking to reap the benefit of influencer marketing without putting in a lot of effort, social media coupons on Amazon are a good first step. 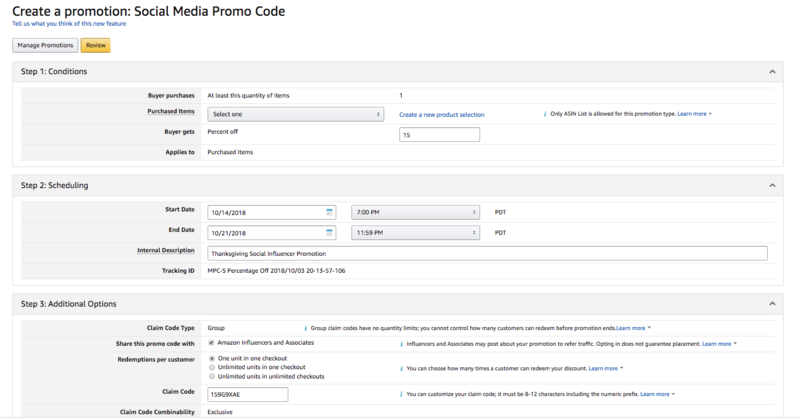 With one click, brands can make special coupons available to influencers who are registered with Amazon. The brand sets the promotion and then clicks a checkbox in the promotions dashboard that shares the promotion with influencers. When influencers log on to Amazon, they find shareable hyperlinks ready and waiting for them. Their audience can click on the link and the promotion is instantly applied. Above: Steps to create and share a social promo code promotion. 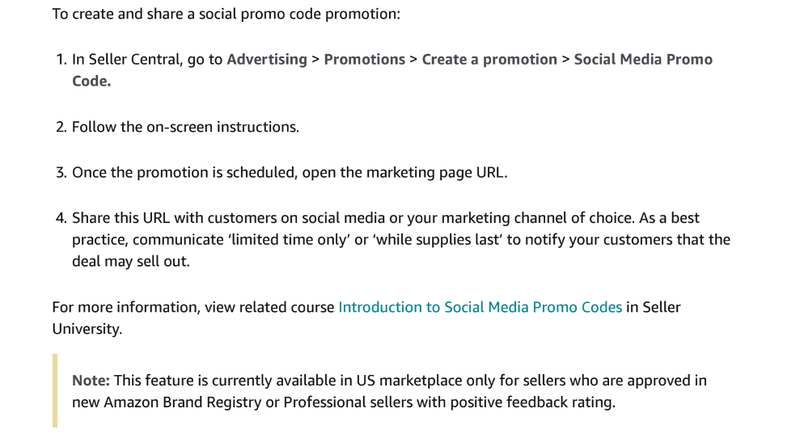 Above: On-screen instructions to create and share a social promo code promotion. This strategy is most useful for brands that want to quickly sell down excess inventory or liquidate products with long-term storage fees. It’s also a way to dip your toe into the influencer pool without spending a lot of time finding and vetting influencers. The drawback to this strategy is you have no control over which influencers share your product. Any influencer registered with Amazon and approved by their process can see your coupon. It may end up on a Facebook bargain hunters page or be shared by influencers that don’t align with your brand’s core values. Finding influencers takes some leg work. There are a couple of websites that offer directories of influencers, but it’s hard to tell what criteria is used to make these lists. You’re also likely to find the same names on every directory you check, which means these people probably get a lot of requests for influencer partnerships. Unfortunately, Amazon has yet to build influencer marketplace discovery into an intuitive search engine. For now, the best way to find individual influencers is by searching for their usual social media handle in the format www.amazon.com / shop / “handle”. And if you’re a brand looking to discover influencers in your category, you’ll need to start by visiting popular social media platforms and searching for keywords or hashtags related to your niche. When you start to see a pattern, someone who comes up talking about your niche over and over, they might be worth looking at as an influencer. How can brands choose an influencer? Brands should do their homework on influencers in general and on the particular influencers they hope to work with. There are a lot of people out there that claim to be influencers. However, to be truly valuable an online influencer must have an engaged group of loyal followers. Validate the reputation of every influencer you work with. Look at their social media sites including blogs, Instagram, Facebook and their Amazon influencer marketplace. There should be a lot of comments and engagement on every post, especially on sites like YouTube and Instagram. Look for an influencer that has a really good interactive back and forth with their community. That shows that their community is really listening to them and is likely to take their recommendations. Look at what brands the influencer has worked with in the past. Have they had issues with those brands? Have they worked with big names or major players in the industry? If so, they’re going to be more valuable as influencers, which also means you’ll have to pay them more. The amount you’ll spend to work with an influencer varies widely depending on the size of their audience and their track record. You can spend less and still make a big impact by working with micro influencers. Micro Influencers have a smaller following, but their followers tend to be intensely engaged. These influencers are up and comers and can generate a lot of buzz. The more closely aligned they are with your niche, the more valuable an influencer relationship can be. For example, This Organic Girl is an influencer in beauty and lifestyle, but she has niched down to focus on organic beauty and lifestyle. If you sell organic, vegan foundation, she might be someone worth partnering with, at least for that particular product line. Influencer marketing is here to stay. Brands in beauty, health, lifestyle and electronics categories are likely to see the biggest return on investment, because these are the areas where consumers are already most comfortable relying on influencer opinion. However, every brand should explore the potential of influencer marketing for their product lines. Bobsled marketing helps brands find the marketing tactics that work best for their brand on Amazon. Request a consultation today or learn more about the services we offer. Newer Post Amazon Launched a Private Label Version of Your Product? Don’t Panic!